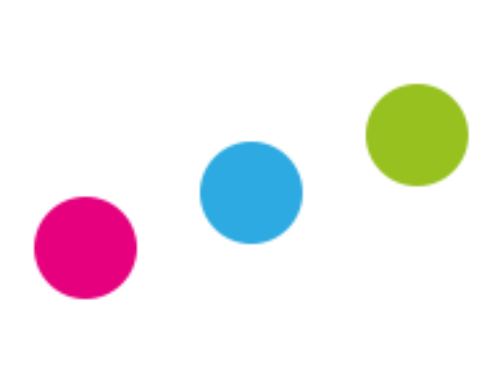 At Datalab we write about half a dozen blogposts in a typical month. Some we slave over and others we knock out in a matter of minutes, usually with one eye on the football or Paw Patrol. Being unashamed data wonks, we then pore over Google Analytics to see which of our posts have left the biggest impression. We are often miffed by how this seems to be inversely correlated with the effort we put in. Earlier in the week we had a lot of positive feedback on Twitter for the chart below, which we had lying around as a by-product of some other work we had been doing. So we thought we would write it up for posterity. 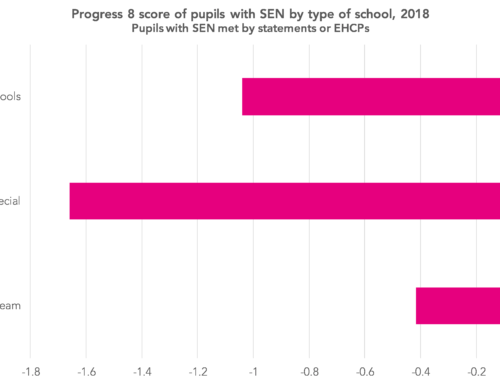 As luck would have it, the averages of these three indicators are broadly similar for pupils we are looking at, at 56%, 58% and 59% respectively. The chart shows that August-born pupils close the gap as they get older but remain behind September-born peers by the end of KS4. However, colleagues at the Institute for Fiscal Studies have previously found no evidence of long-term differences in outcomes among adults [PDF]. 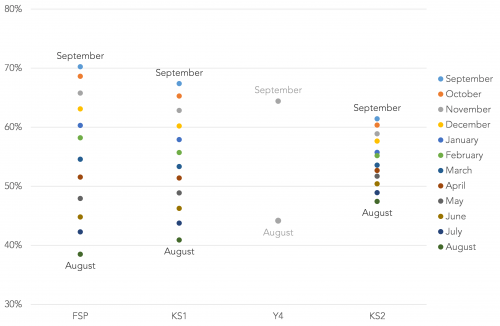 The average Progress 8 score for August-born pupils is 0.18 grades per subject higher than September-born pupils indicating (as the chart above suggests) that they close the gap slightly between Key Stage 2 and Key Stage 4. 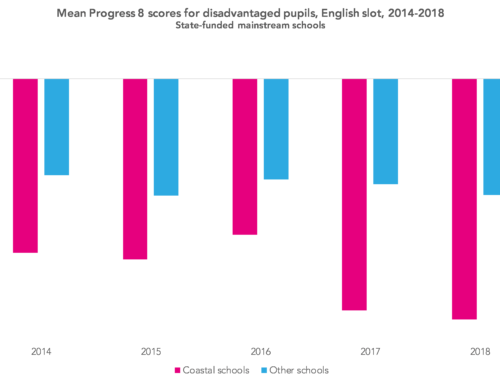 However, in terms of raw attainment (Attainment 8), they remain 0.3 grades per subject behind. On average, September-born pupils achieved 52.4 points compared to 49.5 among August-born pupils. 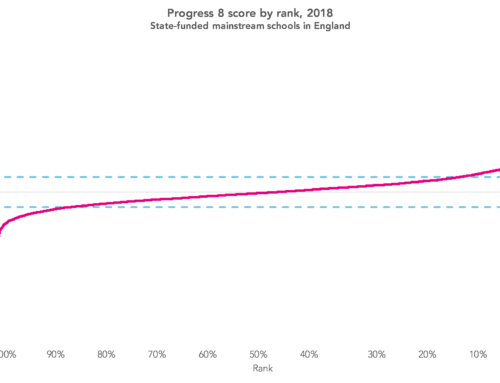 Although we don’t have data on achievement in Year 4, we have included it so that each series is two years apart and we have taken a punt on what we think the results would show for September-born and August-born pupils if we did have it. 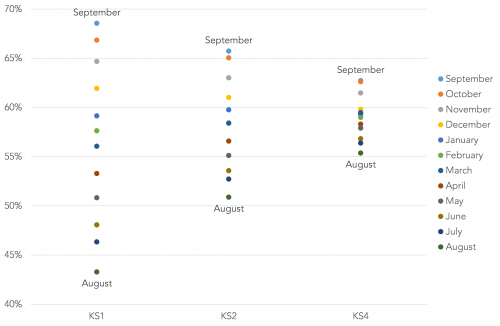 Though crude, the chart suggests that the rate of catch-up for August born pupils was slightly quicker between Key Stage 1 and Key Stage 2 than between Foundation Stage and Key Stage 1. 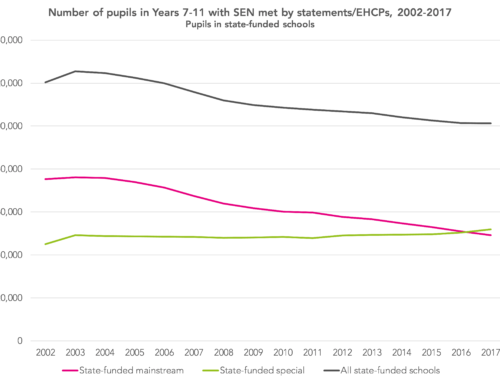 Most secondary schools are large enough not to suffer too much from year-on-year changes in the age profile of its cohorts. But most primary schools are not. Performance can be affected by an increased proportion of summer-born pupils (primary school performance is somewhat volatile in any event). We have long argued that age, gender and other contextual factors should be considered when evaluating a school’s performance. Whilst the birthdate of students is unlikely to have any notable impact upon a secondary school at full cohort level it could if we are looking at the performance of a sub-cohort.For example a school I know has around 15 or so PP students per year group – it is quite possible that there could be big swings in PP P8 from one year to the next purely as a result of differences in their dates of birth. My question is what schools should do to support pupils with summer birthdays? After school and lunch time revision sessions based on star sign, no doubt. Age makes a real difference to attainment. If two pupils start school in the same year group but one is born in September (beginning of the school year) and the other in August, the September-born child is almost exactly a whole year older: the older child turns five and remains five for a whole year whilst the other remains four almost up until the next year. Roll that back to when they’re younger and one will have been walking, playing, talking (and even been alive!) for a year longer than the other. It’s a gap that, as Dave’s chart shows, is still wide at the end of primary school. Also, you’re right, it is related to star sign, as star signs are calendar-based. I should apologise for making a flippant comment that added little to the article really. My criticism was directed at our leadership rather than the very real issue raised. That and the ineffectual, knee-jerk strategies employed to improve student progress. The whole education system needs a big review so it can support all children based on their learning levels before they start school. This would adjust the cutoff for the youngest and eldest children per year group, to cater for mixed age groups by up to 1 year at least. Opting for a later school start like the Finnish do at aged 7 years would enable children to be fully ready to learn in an academic style. The UK is behind many other European models of education and have better attainment and higher achieving pupils who are happier and keep their desire to learn. This is in opposition to UK pupils who get labelled with ADHD etc, due to beng forced into school at 4 years old and summer born pupils who lose interest in learning as their confidence and self esteem is undermined, when they find they can’t keep up or do the work as easily alongside their peers. Children of varying abilities clearly need to be treated as individuals and not robots in our failing and very archaic education system. If and when a new admission code is created for summer born children it will attempt to re dresss the balance that autumn and spring children have always enjoyed, but I believe much more can still be done to support the next generation so they are fit and ready for the jobs market and higher education.